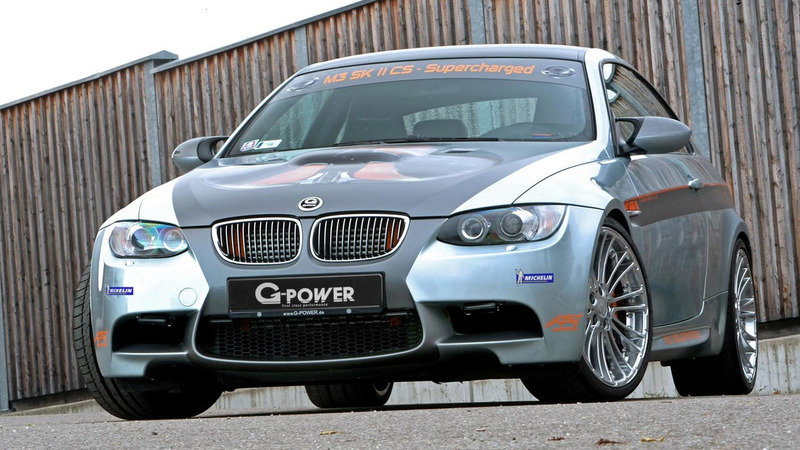 G-Power has updated its supercharger kit created for the previous generation of the BMW M3. A couple of years ago G-Power established a new top speed record for a BMW M3 by hitting 333.1 km/h (206.98 mph) thanks to a SK II supercharger system which bumped output to 570 HP (419 kW). Now, the tuner has installed its beefier SK II CS kit and managed to climb up to 337.6 km/h (209.77 mph) at the high-speed Nardo test track in southern Italy. The updated M3 by G-Power delivers an impressive 615 HP (452 kW) at 8,100 rpm and a maximum torque of 595 Nm at 5,900 rpm. It will do the 0-124 mph (0-200 km/h) run in 12.2 seconds. Other upgrades include a full titanium exhaust system with racing catalytic converters which have resulted in a 26 kg (57 lbs) diet compared to the stock exhaust. Only 30 supercharger kits will be offered by G-Power and the vehicle pictured here has already been delivered to its rightful customer who opted for 20-inch Silverstone Diamond alloy wheels covered in Michelin Pilot Sport rubbers. Full details can be found in the press release section.